This lovely recipe for sea bass is presented on our blue Bubble plate. The recipe comes from Hap&Tap.be. This tartare of sea bass on biscuit is an appetizer that fits perfectly on a happy (after) summer evening: fresh, light, quick ready (besides the biscuit, but you could just bake it in advance). Presented on a colorful plate with a rosé wine and let the (Indian) summer party begin! Let the butter melt au bain marie. Add the eggs, flour, sugar, olives and a pinch of ‘fleur de sel’ together in a standing mixer (Type KitchenAid Artisan or Kenwood) equipped with a butterfly hook and mix into a smooth dough. Add the molten butter and mix in the batter. 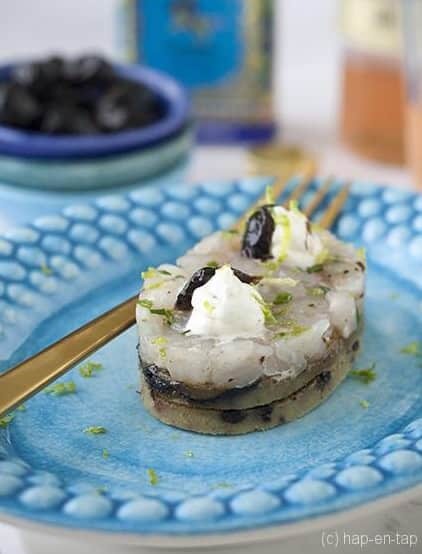 Sprinkle on a baking paper in an oven dish and bake the biscuit for 180 minutes in a preheated oven of 180° C.
In the meanwhile, start with the sea bass tartar. Remove the skin and the gratings of the sea bass. Cut a nice tartar from the sea bass fillets, cut the flesh into strips then dice. Spice up with pepper, fleur de sel, olive oil and fresh chives. Remove the biscuit from the oven and allow to cool. Cut the biscuit into small rectangles (or circles, or ovals). Put a spoonful of sea bass tartar on it. Mix the mascarpone with a spoon of water, pepper, fleur de sel, a few leaves of finely chopped basil and a slice of olive oil. Put in a spray bag and spray some dots on top of the tartar. Finish with lime and olive oil.